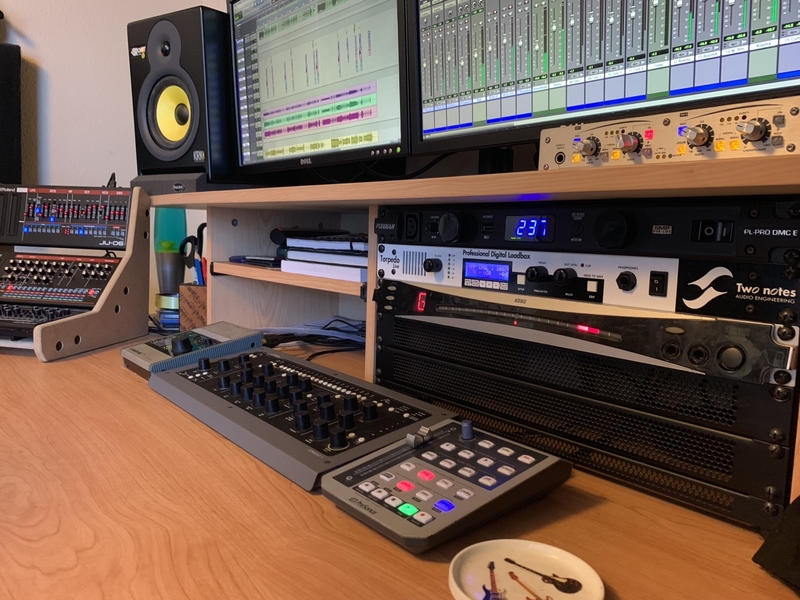 You may be songwriting, demoing or doing full productions. At some point in these processes it isn’t practical or viable to setup and record real drums. What are you going to do? You reach for digital drums. This process is super easy if you are a drummer. Lets face it, most drummers have already screamed at me for suggesting the programming of drums. Not gifted with groove? or are looking for tips to get realistic drums in your productions? here are my 5 tips for programming drums. OK, so this one may seem obvious. It’s something I hear a lot when listening to demos or even some productions with programmed drums. Playing drums or cymbals with not enough limbs to do so. That or playing instruments within the kit in a weird way which a drummer wouldn’t. Remember, drummers on have 2 arms and 2 legs – they can only play 4 different things at once! A couple of examples of this would be playing a tom fill while the previous drum beat is still playing. Or playing too many drums on the same side of the kit. If a drummer would play it for real, it would feel, look and sound awkward. Get around this is with air drumming! Work on the part you are programming. Think about where you would naturally go in terms of what cymbal you would reach for. What you would have to stop playing in order to perform that tom fill? This is what you should be doing when writing your drum parts. Look!, even Bilbo is doing it! They will probably ask to just play it for you. In which case (if you have a MIDI kit to use) problem solved! But at the very least, they will give you an insight into where you may have gone wrong. This is crucial if you want realistic drum programming. Drummers do not hit things with the same intensity every single hit of a performance. This is what consistent velocity information will give you. What ends up happening here is a machine gun or robotic effect in digital drums. Granted, for some of you this is what you need. Some genres even call for it! But we are talking about realistic programming here. I personally would write a drum part in and not worry about the velocity at first. Focus on getting a good part down and take into considerations the points from section 1 in the article. Then, I would take each drum and randomize the velocity a little. Once you’ve found a hit strength or velocity you like, highlight every hit on that drum. In most DAWs you will have a “Randomise velocity” feature. This allows you to do just that, make every hit slightly louder or softer within a given set of parameters. You could also draw this information in manually. The real art of this process though is in the details. This is where having a drummer friend or studying drum performances comes in to play. For example, if they are playing two kicks close together, the second hit is usually slightly louder than the first. If there is a double kick pattern, one foot will be slightly weaker than the other. The same can be true for snare rolls. If there is a flam on the snare, the beat that is last should be louder. It’s this subtlety in your programming that will make people question if a drummer played it or not. That is something you should look to study and improve if you aren’t doing so already. The left half of this track will sound like programed drums – The right half will sound like a real drummer. The power of velocity. One other thing to look at would be not always thinking, “louder is better” in terms of velocity. Yes, the higher the velocity the more attack you have from each drum. It’s a thing drummers call “burying the beater” or “burying the stick” but at the cost of tone. This is what’s happening there (insert nerd alert). When a drummer hits very hard the beater or stick moves into the head and “sticks” briefly. This causes the resonance of the drum to stop but the attack to be huge. What happens here is the tone gets very harsh and not full. Try backing off of the full 127 hits and try putting the loudest hits around 115 in terms of velocity. What you will notice more often than not is the life of the drum starts to come back! Hey, if it’s not loud enough…TURN IT UP! OK, before some of you do a spit take and start writing angry comments on this one, hear me out. Robotic, militant levels of “in time” on occasion are appropriate. That is OK. Some genres of music require this. There are also other genres or occasions where pushing or dragging a groove is appropriate. Sometimes it’s a combination of the two but there is one thing to note here. Feel, vibe, groove are all things that make us tap our toes and nod our heads along to music. It shows up in all genres of music. It just doesn’t always show up on time. Sometimes it’s the imperfections that add groove and feel to a performance and you can program those in. This is what a realistic drum part would look like. Experiment with moving your notes off grid. For example, does your drummer drag a tom fill leading into that bridge to add tension? Are you programming tip hop or neo soul where a dragging beat is advantageous? Are you doing old school punk where pushing the beat in sections might add excitement? You can create this in any DAW by either manually pushing or dragging each hit. Also, by using the randomize feature to go one-way or the other with the timing by a certain percentage. However, I find the best results here come from manual work and experimentation to find the right groove. Don’t be a robot, program in some humanity and soul into your digital drums. Further to the point above, groove and humanity in playing also comes from ghost notes. I know some of you are wondering what ghost notes are. 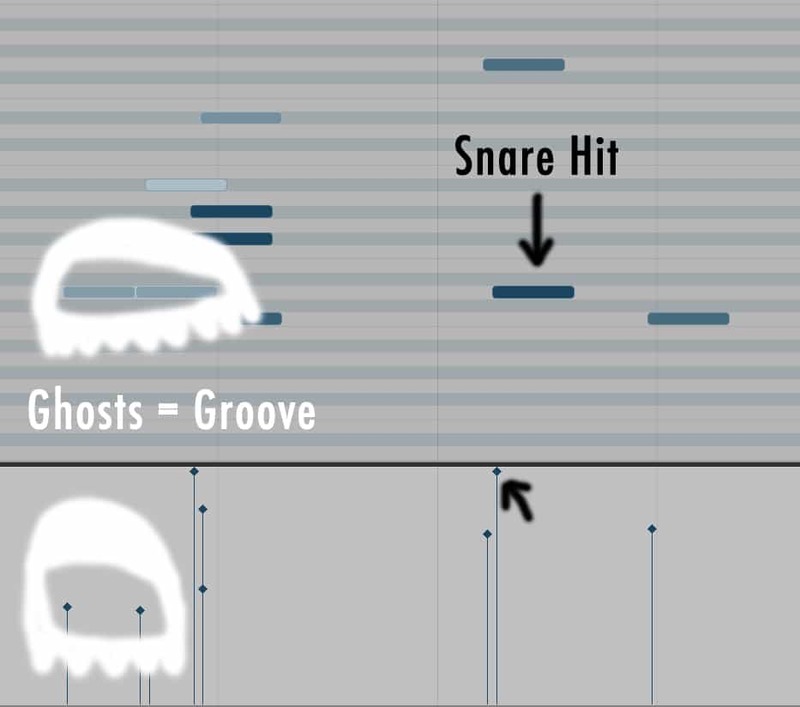 Ghost notes or grace notes are subtle, barely audible hits of a drum. They are typically on the snare, which add to the feel or groove of a song. A perfect example of this is the intro to Rosanna by Toto. Listen to the subtle notes playing between the main snare hits on the snare drum. Now how do those make you feel? Groovy right!? Get them into your drum programming where you think it is appropriate. Do this by adding very low velocity snare hits (usually a velocity of 30 ish). 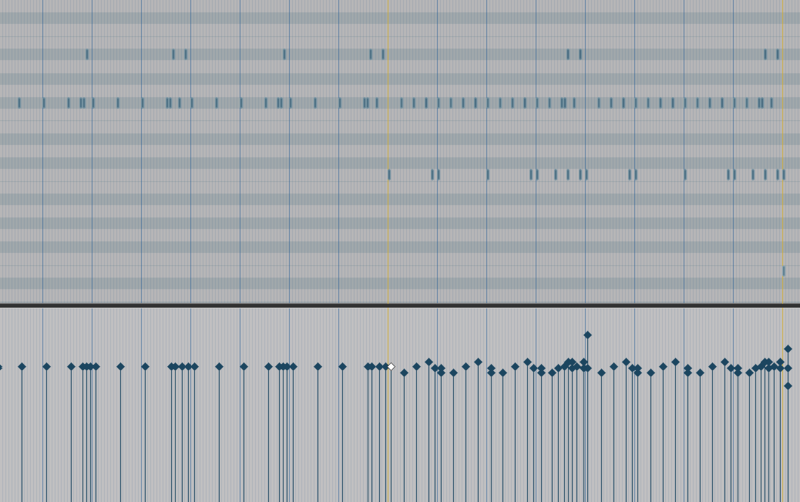 An example of how ghost notes should look in your DAW. Nobody ever learnt anything by getting it right. I would practice this skill and be thinking, “Does this sound realistic?”. Send it out to your drummer friends for feedback too and work on the points they mention. Here is what I do for practice. Get some footage of a drummer performing a song at rehearsal and program the performance exactly how they played it. Listen carefully to the parts and watch their playing. Which side of the kit is that ride cymbal? What instruments are played throughout that tom fill? How hard were they hit? Are there ghost notes? Really dig in and match what the drummer is doing. By doing so, you will also get faster at programming realistic drums and then notice things that drummers do. This may be stuff you have not thought to program before. Lastly, if you can get hold of a MIDI drum kit. Invite a drummer round for coffee or dinner (they generally love both of those things). Then get them to play the performance in or just jam some ideas out. You will get the performance done quicker this way. Also, you will be able to see properly what timing and velocity information is involved in a real drum performance. You can do this by looking at the MIDI information. This is incredibly enlightening once you start paying attention to what is going on in a performance. 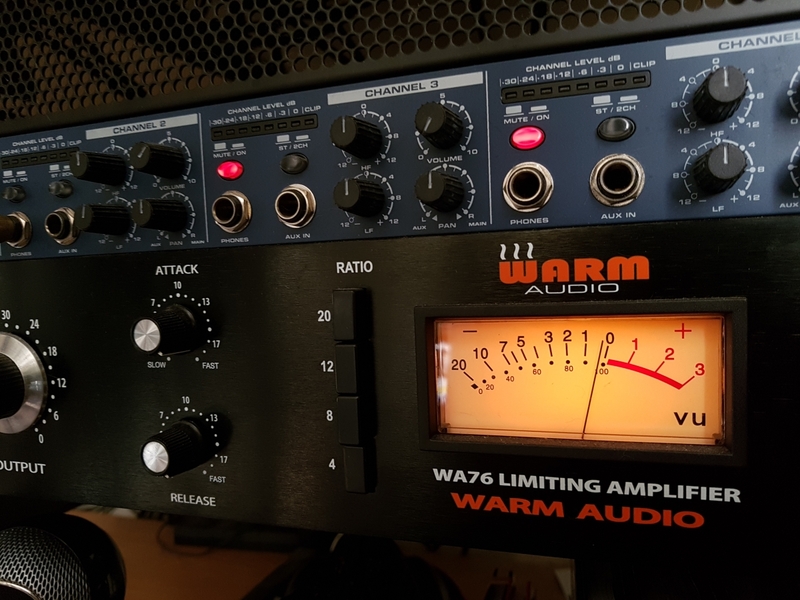 You will then truly understand how to program realistic sounding drums. Here are a few tracks to listen and practice writing parts to. Some are harder than others but all are great to work out how a drummer plays their parts. All are great for using as inspiration for your own drum parts. For those of you looking for a challenge. It’s in 5/4 so make sure to set your DAW correctly! You want to nail some fills? Give this a go! With this knowledge you should be on your way to great sounding realistic drum parts.